Holiday dishes don’t need to be heavy or overly salty or sugary to still be a treat. This vegan salad is an excellent (and easy to throw together) side dish for a larger meal or a stand-alone salad. For the dressing: Whisk together fresh lemon juice, mustard, and olive oil. 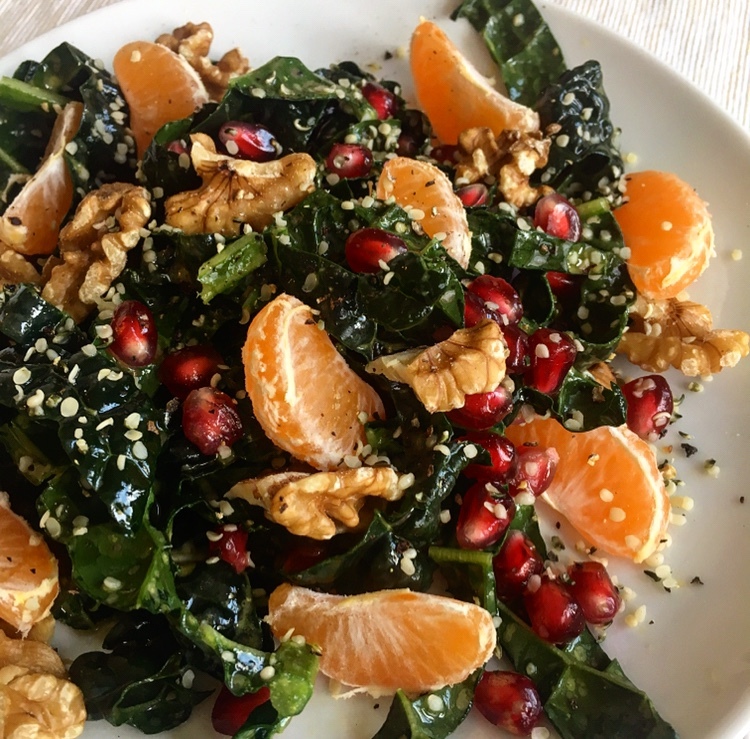 For the salad: Roughly chop kale, add pomegranate seeds, mandarin slices, hemp seeds, and crushed walnuts. Top with salad dressing and add black pepper to taste. Messy messy messy … but worth it ! Given what I knew of the strong licorice flavor, I was hesitant that the fennel process could be that simple or turn out so enjoyable. Once I made this salad though, I realized that it actually is that simple to eat raw fennel and enjoy it. There’s something about preparing this salad with a dressing of citrus, olive oil, and sea salt that cuts the strength of the licorice flavor. Instead, you’re left with a really refreshing salad that’s packed with a bunch of nutrients. Vitamin C plays a big role in fennel and helps to reduce inflammation and may decrease the risk of cancer. Potassium and folate are also prominent and the dietary fiber in fennel inhibits cholesterol build up. Spring is not the time for heavy dishes. This one is filling and nourishing, but light and fresh. It’s a great salad to make in a big batch and use through the week as it keeps pretty well for a few days. The salad is tasty on its own or as a side dish. It’s a nice addition to a bed of lettuce/greens or as a topping for a cold pasta dish. The list of ingredients in this dish is pretty short, but each vegetable carries with it an impressive stack of vitamins and minerals. Rinse the lentils in fresh water. Bring water (3 cups of liquid to 1 cup of dry lentils) to a boil. Cover tightly, reduce heat and simmer until lentils are tender. Separately, chop the carrots, cucumber, purple cabbage, and scallions. Juice one lemon, whisk with dijon mustard and a generous pour of olive oil. Add salt and pepper. Whisk away. Toss the salad ingredients with the dressing. Share with friends. There’s a lot of chopping to this salad, I’ll say that up front. And yes, chopping vegetables can be time consuming. The plus side is that this dish is 100% raw, so no need to wait for the oven to heat up and the food to cook. The salad calls for a lot of creativity – use what’s in season, what looks fresh, and what you can find organically. The rest is basically a personal art creation or kitchen experiment that can’t go wrong. Chop all of the vegetables and combine in a bowl. Mix well. Squeeze lemon juice on top. Add a bit of black pepper, garlic powder, and some red pepper flakes. No oil needed and absolutely no animal products used. Easy! Nutritionally, the okra and cauliflower bring a lot to this dish. Okra is high in dietary fiber, vitamins A, C, and K. Okra also contains B-complex vitamins. Cauliflower delivers a healthy dose of vitamin C, K, and folate. It’s also a good source of vitamin B6.